Jeff Gruenewald’s childhood dream of being a police officer has been fueling his research interests since his undergraduate days at Indiana University, into his doctoral program in criminal justice at Michigan State University and now as a START investigator. His work with START began while studying under START investigator Steve Chermak as an undergraduate. 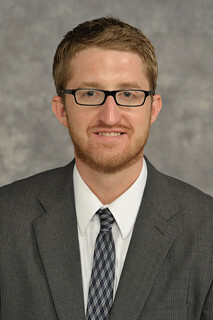 As a doctoral student, Gruenewald received a START Terrorism Research Award to continue his research examining homicide, domestic terrorism and extremism and media representations of terrorism and homicide. While fulfilling his duties as an assistant professor at the University of Arkansas, Gruenewald is now teaching a course for START's Graduate Certificate in Terrorism Analysis program through the University of Maryland this fall. What piqued your interest in studying terrorism? Through the McNair Scholars program as an undergraduate, I spent an entire summer reading and analyzing articles produced by members of domestic extremist movements in support of the book my faculty mentor was writing on the media framing of the far-right wing militia movement. I have been interested in the issues of domestic terrorism ever since. I’ve also been inspired and guided along the way by Dr. Steve Chermak, who has filled the roles of mentor, professor, friend and role model. While I was an undergraduate student, he pushed me to begin writing and presenting my own research. Steve also made sure that I pursued my research interests and took advantage of opportunities to work with other faculty members. He helped open many doors over the course of my education, and has always supported my academic endeavors. Professionally, Steve and I continue to work very well together and we remain good friends today. How did your TRA award from START affect your career? Receiving the pre-doctoral fellowship provided me with the resources to complete my doctoral dissertation. I was also able to use fellowship funds to collect data on extremist crimes that I have since used in more than one academic publication. The fellowship also gave me some valuable insights into the process of acquiring and managing a research award. Since the fellowship, I have received additional research support from START as a co-investigator on the Extremist Crime Database (ECDB). As a member of the University of Arkansas’ Terrorism Research Center, I have also received grant support as a co-primary investigator for homeland security research. What’s been one of the more interesting projects you’ve worked on? As is the case with most things in life, the most challenging research endeavors are also the most rewarding. Witnessing the evolution of the open-source Extremist Crime Database from a single far-right terrorist homicide event to a database is inspiring. It includes detailed information on hundreds of terrorist crime incidents and thousands of suspects and victims of far-right terrorism, eco-terrorism, and al-Qaida and affiliated movement terrorism. Multiple publications have relied on this data to advance our knowledge about issues of terrorism and homeland security. Several students have also relied on the data for their theses and doctoral dissertations. What you currently working on? I currently have several terrorism and homeland security projects underway. One project is examining the characteristics of failed and foiled plots of al-Qaida and affiliated movement terrorists operating in the United States. A second project is examining the circumstances and situational variations that lead to law enforcement homicides perpetrated by far-right extremists. I am collaborating with colleagues at Michigan State University and CUNY John Jay College of Criminal Justice on both of these studies. I am also involved in a third research project with colleagues and graduate students at University of Arkansas’ Terrorism Research Center that is focusing on variations in the temporal sequencing patterns of domestic terrorists’ precursor behaviors. We are particularly interested in how differences in group structure shape the timing of these precursor behaviors. What is your favorite part about your job, as both a professor and researcher? As a researcher, I enjoy most parts of the process. Having a project come to fruition, sometimes after months or longer, is rewarding. It is especially rewarding when the products are recognized and appreciated by other scholars, practitioners and policymakers. I also enjoy working as a part of research teams. I think that some of the best research comes from collaborative efforts. As a professor, I find assisting graduate students in their research projects to be rewarding. I had a great mentor during graduate school, and if I can help my students in similar ways learn how to design research studies and write for academic outlets then I will feel as if I accomplished something. Tell me more about the course you’re teaching now for START’s Graduate Certificate program. I am teaching a course in the Development of Counterterrorism Policies and Programs. The course focuses on the role of state and local law enforcement in homeland security, issues of prosecuting domestic terrorists, and the dilemmas of detaining and punishing terrorists in the United States. I first learned of the opportunity to teach courses for the certificate program during a START research conference about educational programs. I have taught face-to-face courses related to terrorism in the past, and I was very interested in developing an online course related to homeland security. Because of my background, I desired to teach the course largely from a criminal justice perspective and, fortunately, the program welcomed this approach. The students are terrific and I love the live lecture format. I hope the students are getting as much out of the course as I am. Given your full plate of teaching and research duties, do you have any spare time? Yes, I get some here and there. I try to jog every day and enjoy the outdoor activities of northwest Arkansas as much as possible. I also try to read something other than academic research when I can. I find that these activities keep me fresh and allow me to focus on my research for extended periods of time.